Counting by weight is the intelligent method of money counting. Put simply, it’s a fast, easy and highly accurate method of counting cash. Cashmaster’s weight-based money scales help your business work more efficiently and prevent loss. Counting money by weight is more than six times faster than by hand, 100% accurate and proven to significantly reduce cash shrinkage. Additionally, our money counting machines can instantly reconcile takings and allow you to conduct on-the-spot audit checks. Every Cashmaster count-by-weight machine is built to the highest standards. They are lightweight and portable with silent operation and a small footprint, making them ideal for the retail, office or even front of house environment. 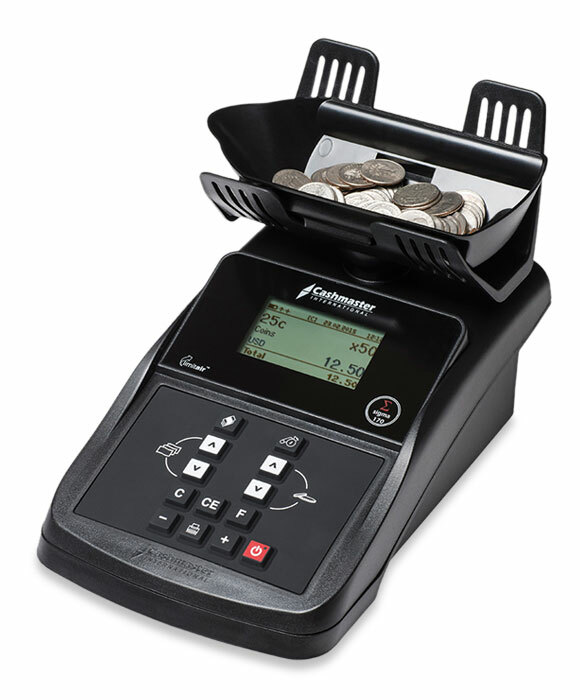 Every Cashmaster count by weight machine employs five independent techniques to ensure absolute accuracy when money counting â€“ giving you assured accuracy time after time. A Cashmaster count by weight money scale will standardise your money counting procedures, eliminating human errors and create an audit trail. Quick and easy documentation can be provided for bank deposits with the printer option. Connectivity allows data to be easily transferred to a PC or in-house systems. By saving time, increasing loss prevention and increasing efficiency and reconciliation practices â€“ 90% of Cashmaster’s customers benefit from a return on investment in three months or less.